Pressure washing is an effective way to thoroughly clean your decks, siding, patios, driveways, and other exterior areas of your house or business. Sure, this process seems simple, but if not done correctly it can cause more damage than good. If you’ve ever done your own powerwashing around the house, you’ve probably figured out the hard way that using the wrong tip or washing too close to certain materials can COMPLETELY strip things like paint right off. All that power is awesome for things that are more permanent like brick or concrete, but it can gouge wood, strip paint and cause some serious issues if done improperly. 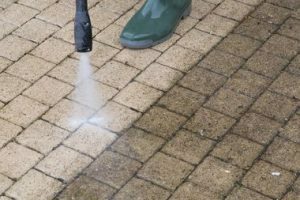 Besides possibly damaging your property, powerwashing can be incredibly tedious – back and forth with nice even strokes for hours in some cases. Move patio furniture out of your way constantly, getting in behind things that can’t be moved like shrubs and bushes… Filling and refilling the little home versions of these powerwasher units. Ugh. Who has TIME for all of that? Unlimited Professional Services Powerwashing Does! Get the Raleigh experts to powerwash your trouble spots with the appropriate professional equipment, and the correct nozzle and pressure settings for each specific job. Here at Unlimited Professional Service, we provide specialized power washing services in Raleigh area to get the clean deck, patio, driveway and other surfaces you want, fast! Why Have Your Property Power Washed? Exterior surfaces of your property are always exposed to harmful elements, may it be natural or man-made. Ultraviolet light rays, rain, wind, dirt, and grime attack your home’s surfaces causing them to degrade, discolor, or chalk over time. Mold, mildew, insects, birds, tree sap and other elements can add to these effects. Industrial pollution and automotive exhaust, acid rain, chimney soot, and the likes also take their toll on your home over time. If not removed every so often, these things can destroy the beauty and significantly reduce the value of your property. To preserve the appearance and value of your home, we recommend scheduling periodic power washing of all of your exterior surfaces. Common areas that need this kind of cleaning are your deck, gutters, patio, walkway, and driveway. The frequency, however, depends on local conditions. Unlimited Professional Services will help make your home’s exterior surfaces look newer. We ensure a good, thorough pressure wash that will dramatically reduce the wear and tear of your property. Contact us today and let’s discuss your home’s needs. We will answer your questions and give you a no-obligation, free estimate. Make the Right CHOICE for Your Home’s Pressure Washing Needs! Why should you choose us as your source for top notch power washing services? Our team of skilled professionals offer a complete range of power washing and exterior restoration services in Triangle area. Plus we only use the highest QUALITY and SAFE products as well as MODERN equipment to make sure your property receives the most efficient pressure washing cleaning treatments it needs and deserves. At Unlimited Professional Service, we strive to provide pressure cleaning services to all our customers in North Carolina with the best cleaning service experience possible. We ensure to safely clean and protect the all types of surfaces at your home – from unpainted wood siding, bricks, stones, decks, driveways, patios, garage floors, and so on. We are proud of our meticulous approach in all the cleaning services that we do. We start with a presoak foam that penetrates your outdoor surfaces to loosen even with the most persistent the dirt and grime. Then we do our signature and non-damaging controlled pressure washing service. And lastly, we apply a protective finish to help them much cleaner for longer. We constantly provide services that are tailored to the particulars of your unique property. Give us a call today to get your free estimate! Remember, Unlimited Professional Services offers a 100% Satisfaction Guaranteed – WE ALWAYS MAKE IT RIGHT! Interested in Raleigh Triangle Commercial powerwashing?